Proper precautions start with the installation – which should be completed by a trained stove technician. Even with a perfectly executed setup, however, your stove’s performance and safety can be hindered by blockage. Wood pellet stoves operate through a system of air intake and exhaust. If this system is hindered by snow and/or leaf buildup outside, or burn residue inside, proper combustion of the pellets can’t happen. Unlike wood stoves, pellet stove venting can be either horizontal, vertical or both – so make sure you know where potential blockages could occur. While wood pellets burn far cleaner and with less residue than firewood in a wood stove, creosote accumulates with any wood-burning. Therefore, we strongly recommend a thorough professional cleaning at the beginning or end of each heating season. In addition to an annual visit from a professional, you should also be cleaning your stove throughout the winter. 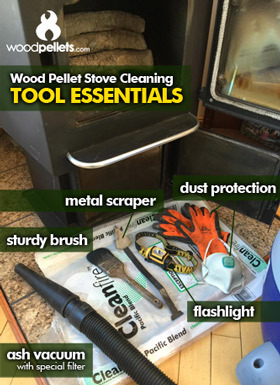 The frequency of your cleanings will depend on the type of wood pellets you’re burning and how much ash builds up. In order to get the most out of your time, it’s critical to have the right tools for the job. For a productive DIY cleaning, we recommend using a metal scraper, a sturdy brush, a flashlight, ash vacuum with the right filter and dust protection. Finally, be sure to use a surge protector. Most modern pellet stoves have a circuit board that can be damaged without protection from even small electrical surges caused by power outages. Refer to your manual for information on electrical recommendations. New Hampshire also has no inspection authority. Most States and local governments have a building inspector or fire marshall to go out and inspect new installations. Many States require professionals to certify themselves or hold a license. Not New Hampshire. Live free or die…and somebody very well could have died. Why is it that New Hampshire continually has more stove related fires than neighboring States?